Sudden Cardiac Arrest is the leading cause of death in young athletes in the United States. The best way to detect these heart conditions is through a heart screening using an EKG (Electrocardiogram). An EKG screening analyzes the electrical signals of the heart, and is not typically provided at a youth’s annual physical. The Ryan Lopynski Big Heart Foundation, with the support of local cardiologists, technicians from fire and rescue or medical facilities, and other volunteers will conduct FREE ON-SITE heart screenings for students from ages 12-26 years of age, and the results will be reviewed on site by local cardiologists. 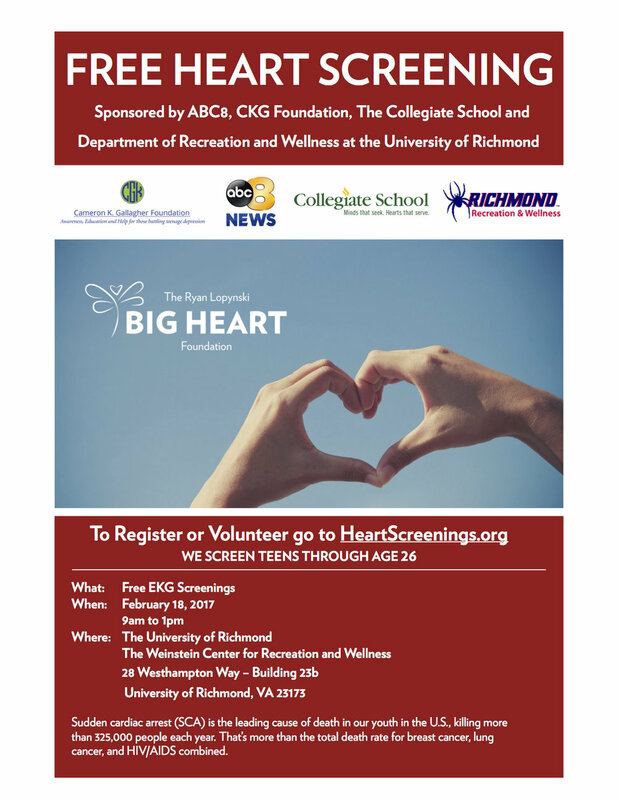 Prevent Sudden Cardiac Arrest in children and young adults: register for a free screening today!